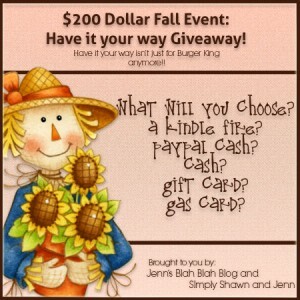 Jenn's Blah Blah Blog, Diva Fabulosa and Simply Shawn & Jenn are bringing you an awesome FREE Blogger Opportunity! Blogger gets FREE Facebook link with the option to purchase additional links! Jenn's Blah Blah Blog had a giveaway just like this called the Sizzling Summer Giveaway that was fabulous, so were going to bring it back over and over and over again! This time Simply Shawn & Jenn has decided to join in the fun to celebrate reaching over 10K fans! The blog is absolutely fantastic. Excellent Blog. I really want to admire the quality of this post. I like the way of your presentation of ideas, views and valuable content. Lots of great information and inspiration, both of which we all need. Thanks for such a continuous great postings.